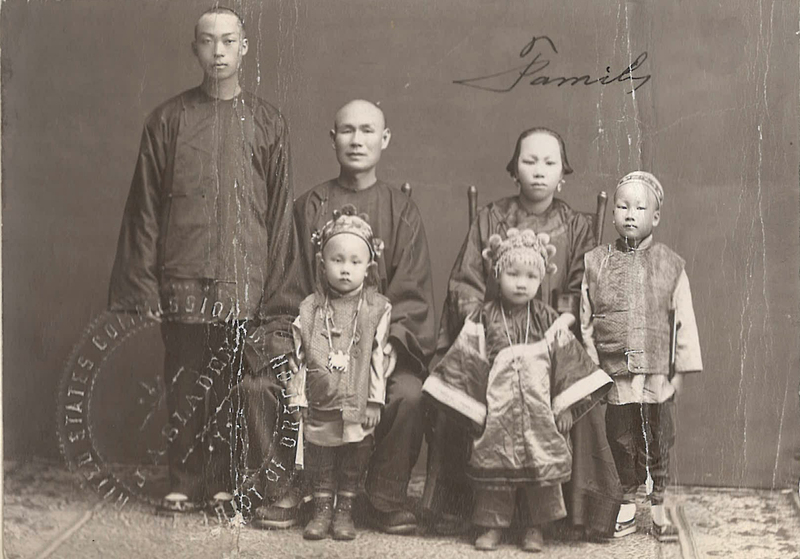 “Wong Gai family portrait” ca. 1903, Chinese Exclusion Act case files, RG 85, National Archives-Seattle, (Chin) Lin Hay (Mrs. Wong Gai Kee) case file, Seattle Box 65, 32/2355. (Chin) Lin Hay was born about 1863 in Gong Ming Village, Sunning District, China and first came to the United State in 1893 landing at Portland, Oregon. She arrived with her son Wong Gut Bow and daughter, Wong Toy Gew. Wong Gut Bow died in 1903 or 1905 on a ship en route to China. He was married to Lee Shee and they had a baby daughter, Ah Gui. In May 1907 Mrs. Wong Gai applied for admission as the returning wife of a domiciled merchant, Wong Gai, of the Gai Kee Company of Portland, Oregon. Her status was upheld based the testimony of six credible white witnesses who swore that Wong Gai had been the head of the Gai Kee Company for over twenty-five years and that he was registered by the government as a merchant. The Caucasian witnesses interviewed by John B. Sawyer, Chinese Inspector, were William Bohlander, F. H. Saylor, O.P. S. Plummer, James B. Young, F.M. Anderson and W. R. Kerrigan. They testified that Wong Gai bought and sold vegetables. Mrs. Wong Gai admittance depended of proof of Wong Gai’s status as a merchant. Mr. Sawyer carefully investigated Wong Gai’s place of business. He noted that it looked like a junk shop and did not have much inventory of goods but it had once been a thriving business. And most importantly, Wong Gai did not engage in manual labor. He kept roomers and boarders to supplement his vegetable business. Sawyer reported: “Wong Gai says he will continue producing witnesses so long as the Government is not satisfied with those examined but that no one would be better qualified to testify than those already produced.” Wong Gai kept his status as a merchant. Mrs. Wong Gai returned with her three children, Gut Fong/Tong (born July 1897) and Gut Tung and Louie Hie (born January 1899). The twins were admitted as returning native born citizens of Portland. Her son Gut Fong/Tong, was born during her temporary visit to China, and was admitted as the minor son of a domiciled merchant. An attempt was made to bring in Ah Wong, a substitute for Mrs. Wong’s deceased son Wong Gut Bow. He was declared an impostor and was deported. In 1927 Mrs. Wong Gai Kee (Chin Lin Hay), age 64, was applying for a laborer’s return certificate. Mrs. Wong’s 23-year-old son, Wong Git (Gut) Fong, also known to white people as Nick Wong, testified for his mother. He worked as a waiter at Huber’s Restaurant in Portland, Oregon. The application was given a favorable endorsement. Other case files listed in connection with the case include files for her husband, Wong Gai; their children and grandchildren.